Abstract: Medical devices, autonomous vehicles, and the Internet of Things depend on the integrity and availability of trustworthy data from sensors to make safety-critical, automated decisions. How can such cyberphysical systems remain secure against an adversary using intentional interference to fool sensors? Physics-based  cybersecurity risks can bubble up into operating systems as bizarre, undefined behavior. Transduction attacks using audible acoustic, ultrasonic, and radio interference can manipulate sensors found in devices ranging from fitbits to hard drives to implantable medical devices with implications to file system integrity and human safety. Defenders can fight back with physics and more trustworthy software APIs. I’ll wrap up by explaining how ultrasonic exfiltration could have caused the symptoms experienced by diplomats harmed in Cuba. Biography: Kevin Fu enjoys early-stage, interdisciplinary research where there are still many par-baked problems to define and solve. 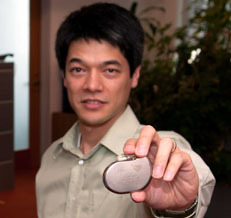 Kevin was recognized as an IEEE Fellow, Sloan Research Fellow, and MIT Technology Review TR35 Innovator of the Year. He serves as chair of the CCC Cybersecurity Task Force. His students received some best paper awards. Kevin earned a certificate of artisanal bread making from the French Culinary Institute.